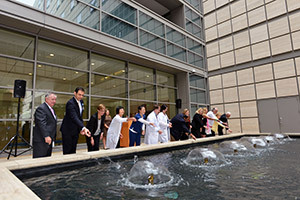 Representatives of UCLA, One Legacy and patient families toss commemorative medallions into the Gift of Life Fountain during a dedication ceremony outside the Ronald Reagan UCLA Medical Center. Two years ago, Rachel Greenberg of Marina del Rey went out to run a few errands. While she was gone, her husband Glenn suffered a massive brain hemorrhage. He was immediately taken to Ronald Reagan UCLA Medical Center where physicians explained he had suffered the worst kind of brain bleed. They operated, but after four days it was clear that the hemorrhage had caused too much damage, and he would not survive. Glenn was kept on a ventilator until family members from the East Coast could arrive. During this vigil, Rachel learned that when Glenn had renewed his driver’s license a few months earlier, he had signed up to become an organ donor. Glenn’s donation went on to help 89 individuals, ranging in age from 19 to 92 years old. 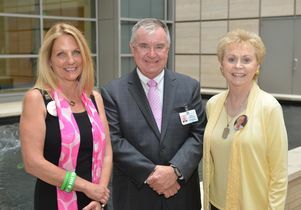 “Organ donation is a positive and powerful thing we can do to help families and loved ones transition from grief to opportunity to help others who are in need,” said Dr. Paul Vespa, director of neurocritical care at Reagan UCLA Medical Center and a professor of neurosurgery and neurology at the David Geffen School of Medicine at UCLA. Dr. James Atkinson, interim associate vice chancellor and president of the UCLA Hospital System, is flanked on the left by Rachel Greenberg, whose late husband, Glenn, became an organ donor, and on the right by Lois Foxen. Her late husband, Gary, a lung transplant recipient, provided a monetary donation to help create the UCLA memorial honoring organ, eye and tissue donors. To honor these special donors who became organ, eye and tissue donors at the time of their deaths at Reagan UCLA Medical Center or UCLA Medical Center, Santa Monica, UCLA Health and One Legacy, a nonprofit organization dedicated to saving lives through organ and tissue donation in greater Los Angeles, held a ceremony Tuesday to dedicate the Gift of Life Fountain, located at Reagan UCLA Medical Center’s Garden of Peace. Loved ones of donors will be able to place special engraved medallions in the water; the donor’s name will also be added to an online donor recognition webpage. The concept of honoring organ, eye and tissue donors has been years in the making at UCLA. The project finally became a reality, thanks to a monetary gift made by the late Gary Foxen, a UCLA lung transplant recipient. Representatives from UCLA, One Legacy and families then ceremoniously tossed medallions that represented organ, eye and tissue donors from 2008 to 2014 into the water. For UCLA nurse Barbara Anderson, who has worked in the neuroscience field for years, the memorial represents humanity at its very best.